Straight outta Montreal comes another great find on SoundCloud. I first found this electronic artist while performing my favourite pastime, which is to listen to related tracks of a song I am currently digging. I have no idea what SoundCloud's algorithm is for linking these tracks together, but it is spot on every time. 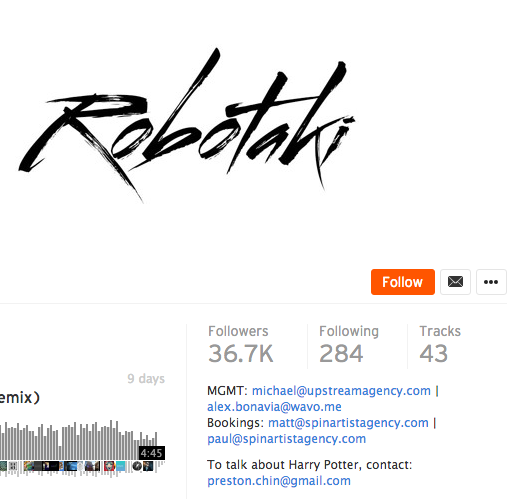 "To talk about Harry Potter, contact: preston.chin@gmail.com"
In case you aren't familiar with SoundCloud, this is the usual area where the management information goes, as seen above that quote. 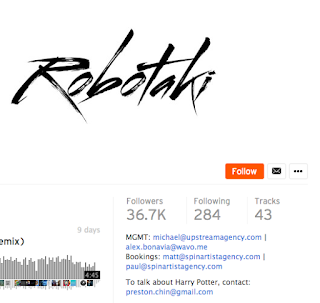 But Preston, whom I can only assume is Robotaki himself, just wants to chat with you about Harry Potter (and presumably his awesome music). I finished the Bahamas logo! I can't express my excitement to get this thing put on a real-life t-shirt. I got slightly ahead of myself and posted the logo to Dribbble, because why not. I also somehow forgot to add my current position at EventMobi to my Linkedin profile. I've been getting the odd job offer, which I thought was due to having added the position. But it turns out that Linkedin thinks I am unemployed! No longer. I also added my recent win in the Startup Weekend in September. Speaking of Startup Weekend, I am going to start working on getting the work I did during the hackathon to a polished portfolio piece. I am really proud of the hard work that my team has already done, and I did enough design to get this thing to a final stage for sure. Plus it will be a good exercise in a bit of product thinking/design on my own. 1) Put placeholder page in motion on website - This week. I will be making the placeholder page this week, as well as starting to work on my dad's business card and continuing work on the "Brew Beer Drink Beer" project. Not to mention cleaning the apartment for Friday's housewarming. Lots to do! As you may recall, I made a delish stew last week and have been portioning it off to eat pretty much every day. Nothing like a good stew. But if I am walking to work every day with a small purse, how am I to transport this wondrous stew? The answer is mason jars. I don't know what it is about walking around with a mason jar full of stew tucked into my purse, but it's a really good feeling. Maybe it makes me feel homey or maybe I feel safe knowing I could crack someone over the head with it if I really had to. I live in a safe neighbourhood but you never really know. I have been keeping myself abreast of the free events in Toronto, as seen through the lens of Facebook. And boy, there are a lot. Between the city of Toronto, the Drake Hotel, and The Harbourfront Centre, I would never go home. This past Saturday, the city held a non-denominational winter holiday party at Dundas Square, complete with live music, acrobats, lanterns, and a giant white piano. It was awesome to watch a live performance outside in a big group of people before the weather gets too cold (although let's face it, I'm still going to go to these things when the weather gets really Canadian).